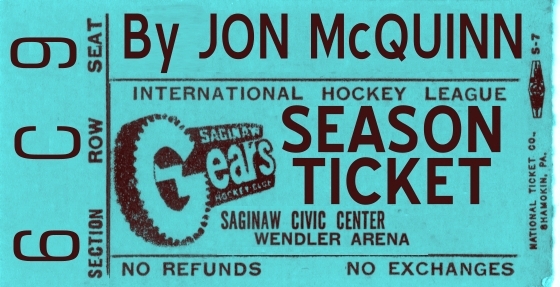 I would love to tell you about how the Saginaw Gears marked my introduction to hockey, a sport which I continue to love to this day. Being a Saginaw native – and someone who turned 10 years old a few weeks after the team’s first game – it would make for a nice story. The truth is, my introduction to hockey came a few months before the Gears were born. Sometime early in the 1971-72 International Hockey League season I was sitting at home with my parents in Shields on a Saturday night. I was flipping through the TV channels – all three of them – and there, on WJRT TV-12, was this group of hockey players getting ready to start a game on the smoothest, brightest sheet of ice I had ever seen. It turns out that TV-12 carried the occasional Flint Generals road game back then, and this was their first telecast of the season. Long-time Generals PR guy Carl Robertson did the play by play; I think the opponent was the Fort Wayne Komets. The puck moved so fast, the players skated so fast, and the crowd seemed so excited. I watched that game from start to finish. I honestly could not get over what I had just seen. Robertson gave the date of the next telecast, and I grabbed a pencil and paper and wrote down the date. TV-12 aired three Generals games that season, and I watched every second of every game. Please try to understand my situation. There was very little NHL hockey telecast in the area back then. CBS carried a few games on Saturday afternoons, but for whatever reason, I never saw any of them. NBC would not begin its next foray into the NHL until 1972-73. And out where I lived, well, Thomas Township wouldn’t be wired for cable television until the summer of 1980. This meant no Red Wings’ games on Channel 50 out of Detroit, no Hockey Night in Canada coming from CBC Channel 9 in Windsor. I didn’t care that this was the Flint Generals of the IHL. In fact, I thought it was kind of neat that there was this hockey team so close to home that played games on live TV. 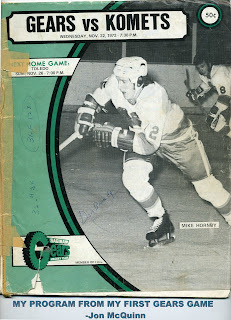 Early in 1972, word came that Saginaw was going to put a team on the ice for the 1972-73 IHL season. Honestly, I wasn’t sure what to do when I first heard the news. I mean, how could I possibly root against “my” Generals? Trust me, it didn’t take long to change my colors. I’d also like to tell you that I was one of those in attendance for Saginaw’s first-ever hockey game in the Saginaw Civic Center, an exhibition game between the 1972 U.S. Olympic Team (a team that included future Gear Stu Irving) and a cobbled-together group put together by Gears owner/general manager Wren Blair called the Saginaw Stars (whose roster included Dennis Desrosiers). But this, too, would be a lie. I was inside Wendler Arena soon after it opened, but for the Shrine Circus. The new season began, and I started listening to Gears games on WSAM. Wins were rare, but I began to connect with the names – Desrosiers and Irving, Cal Hammond and Mike Legge, Mike Hornby and Steve Lyon. Finally, the Wednesday before Thanksgiving, November 22, 1972, I came home from school and found out I was going to that night’s game against Fort Wayne. My brother, my parents and I climbed into our 1969 Buick Electra 225, parked in the ramp, took the overhead walkway over Johnson Street to the Civic Center, and walked into Wendler Arena. Then came the walk up the short stairway, at which point I could see the arena for the first time. I think this is always a magical time for a kid who loves sports, that time when you catch your first glimpse of the playing surface you’ve only seen before on television, or perhaps only in your mind while listening on radio. Whether it was that first glimpse of bright green grass at Tiger Stadium, or a place as antiseptic as the Pontiac Silverdome, seeing a sports venue for the first time is always something that has left an impression on me – still does. And so it was with Wendler Arena in 1972. The place only seated 5,463 – sometimes a few more – but it may as well have been Madison Square Garden, for I had never been in an indoor sports arena that large in my life up to that point – and had never seen a hockey arena, period. And there it was, all those blue seats and orange seats, and the ice, even smoother and brighter than what I saw on that Flint Generals telecast a year earlier. There was the big ‘G’ at center ice, outlined with gear teeth for obvious reasons, and that huge, imposing scoreboard overhead, with the big “Second National Bank” advertising signage atop. There was that fresh popcorn smell, and organ music, and players down below going through the ritual of the pregame skate. The game? The Gears lost, 6-5. Until I find my ticket stub, I’ll tell you that our seats were either in Section 15 or 17, upper level. It was Student Night (EVERY Wednesday game was Student Night), so my brother and I got in for $2 each, if memory serves me correct. I believe backup goalie Ray Gibbs started that game and I certainly remember that the crowd was large, and noisy. One other thing I will mention from that game was a practice that continued through that entire first season; after every offside and icing call, public address announcer Jerry Werle would inform his audience with the news – “Offside, Saginaw.” It seems comical now, but was a good idea. Every single home game there was more and more people walking into that arena to watch hockey for the first time. What was wrong with helping these folks learn a little about the sport? I attended two more games that season, a mid-season game against the Port Huron Wings (also puck night) and another late in the season against the Des Moines Capitals (stick night). The Gears won both. As for the season, the team was competitive, but lost a lot of close games and missed the playoffs. No matter. Hockey had become a huge success in Saginaw, and the future seemed bright. As for me, that season helped to cement my status as a hockey lifer. With maybe a little help from the Flint Generals.